I skipped last Friday because I was in a wedding that day, and we were swamped all day with wedding stuff! It was fun, but it didn’t leave me any time at all to blog. So this FF is for two weeks. Nothing tastes as good as being healthy feels. Nothing tastes as good as being healthy feels. Nothing tastes as good as being healthy feels. As long as I keep repeating this to myself, I’m fine. The reality I’m dealing with is that I can’t stand the taste of veggies (I’m not kidding… this is complete with gagging and throwing up in some cases. Dramatic, I know, but it’s the God’s honest truth) and I love sugar (like most people do). I’m doing all I can to train myself to eat better food, but this is way more challenging than I thought it would be. One challenge that I’m facing is that as a Catholic, we really aren’t supposed to eat meat other than fish or other types of seafood on Fridays during lent, but finding good, reliable fish around here right now is difficult. However, I need the protein because I’m working out so much. This tradition normally gets ignored, and I eat chicken. One other challenge I’m facing is that I discovered that I’m not eating enough calories in a day. Furthermore, I’m not eating enough of the RIGHT calories in a day. IF I get the right amount, that’s great, but it’s not great if the right amount is coming from cookies and brownies. I’m trying to overcome the vegetable thing. I have managed to get myself to the point where if the vegetable is chopped up into super small pieces and mixed into whatever I’m eating, it usually goes down better. This includes salads- if the broccoli is left in big chunks, I can’t eat it. If it’s really small though and mixed with the spinach (that I love), it goes much better. I’m great on fruits though because of the sugar, so I actually need to scale back on those. I still love the green smoothies, although I have discovered that without banana, it tastes much more vegetable-like. So, I need to work on eating the right amount of the right food. Nothing tastes as good as being healthy feels. Amazingly, I’m doing awesome with fitness. Due to the medical problems I have (thanks in large part to being fat), I really thought this was going to be an issue. I figured out though that the less I move, the harder it is to move. So if I can get up and immediately go eat breakfast then work out, I set myself up for a day of movement. However, if I’m lazy that day and don’t move, it’s harder to do so later. I’m trying to change my morning habit so I can get into a routine. One of the ways I’m accomplishing this is to consult my at home strength training flashcard deck. I know there’s a snazzier name for them, but for now, they’re my flashcards. The idea for these came about as a direct result of me being bored with doing the same workouts for days, and having too many workout at home bookmarks on my computer. So, I decided to print out all of the articles. This isn’t even all of them, actually. They come from a wide variety of sources, from blogs to magazine articles, to random pieces of advice given to me. 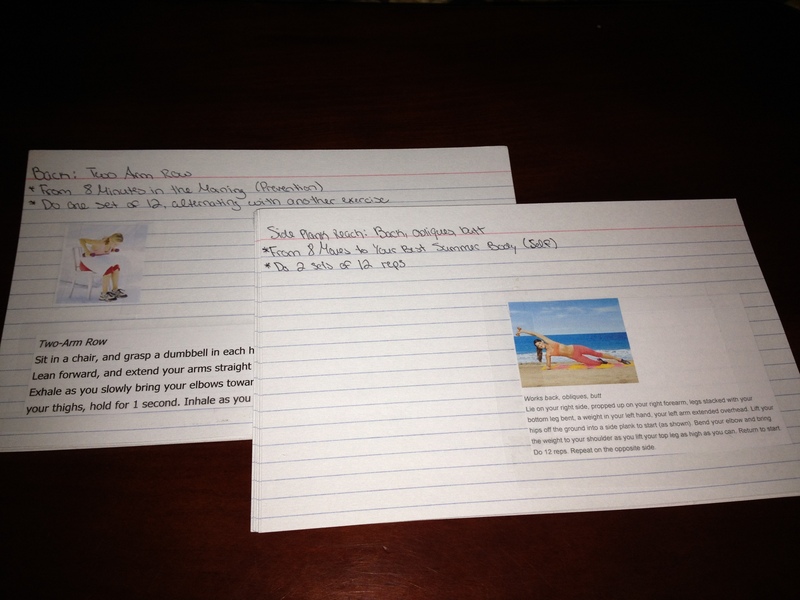 Anyway, I cut all the workouts out from the printed versions of the articles, and taped them to a large index card. I put the body part (or parts) that each exercise focuses on, the source of the article, general instructions in terms of reps and sets, a picture from the article if available, and the instructions for each exercise from the article. I feel that working out while consulting a card is way more efficient and less cumbersome than trying to maneuver my computer into place so I can read the screen while trying to do these. I included the body areas targeted by each workout (remember, the more large muscle groups worked at once, the better), the source of the article (many came from Prevention or Self), and instructions in terms of sets and reps. I cut out a picture of the exercise being performed and the exercise instructions from the articles themselves. Once this was done, I ended up with a stack of about 130 cards with one exercise on each one. I have about an hour set aside each day, and I simply select two or three cards to do that day in addition to my 100 push ups challenge and cardio. Now, I’m not delusional. I know that these alone aren’t going to get the job done by themselves, and that’s ok. My goal with these is simply to get up and do something, which sets me up for an entire day of healthy movement. I look at them as a warm-up to my day. An hour of these with a good stretch afterward really works well for me. I always add my walk/jog with the dog at the end of the day and I do the challenges from my Leap Into Summer group as well. I am going to take my measurements again and get on the scale. I have been a little weary of the scale since my four pounds incident, but I think I have done well enough now for some weight to have come off. In terms of diet, my goal is still to eat the right amount of the right calories of mostly veggies, healthy carbs, and protein. Another goal for next week is to not drink any soda. None. I HAVE to drink more water, and the only way that’s happening around here is if the soda isn’t even a choice and water is. I would also like to really keep a great log of my 21 Day Weight Loss Challenge points next week as well. I gained four pounds. I know I shouldn’t be surprised after that horrific week I had, but I GAINED FOUR POUNDS. Well, at least my scale says I did. I’m not quite sure if it’s the sodium and I’m retaining water really bad, or if I really have gained four pounds, or what. Are there any tips out there on maintaining a consistent workout schedule? I’m asking because apparently that’s my biggest problem. I’m great for one or two days, then one bad day happens and I can’t seem to recover from it quickly and just jump back into my normal routine. There is NO room to mess around this week. I *must* keep right on track with my points in the Mommy Blogger Weight Loss Challenge (<— this is the name of the program. I swear I’m not making random capitalization errors). I walked all day today (I have a friend in town so we went sight seeing) and managed to skip the fried onion appetizer at dinner. Green smoothie tomorrow for breakfast I guess and we’re grilling chicken for dinner tomorrow with some sort of quinoa and veggie based salad. I was going to add more workouts, but honestly I think I need to work on getting the nutrition down to a science first and then slowly add more workout routines. Walking/jogging with the dog for several miles every day, and the 100 push ups challenge will have to suffice for now. After all, no amount of exercise will compensate for a bad diet. I’m also buying new shoes tomorrow. Mine are starting to actually cut (literally) my feet and that’s just not going to work for me. I quickly realized that the middle of the week with Wordless Wednesday going on was not a good place to post my fitness accomplishments and setbacks. So, instead of Workout Wednesday, I’m installing Fitness Friday (because alliteration is all the rage in the blog world). I have to credit Janet from Going Crazy, Wanna Go? for the idea and guidance in putting this together. It’s been a week full of setbacks, if I’m being completely honest. It really has. I’m working on a pretty large project outside of the blog that had me up really, really late every night and getting up early the next morning. This resulted in exhaustion, and honestly food was the first luxury to go because I was simply too exhausted to feed myself properly. To make matters worse, my husband was gone all week for work, which left me to single handedly take care of all the household responsibilities. I know that it shouldn’t matter whether or not he’s home, but the reality is that it’s easier because I can focus on one or two things and we can split up the responsibilities. Oh well, these things happen (is what I’m trying to tell myself). Starting weight: To be revealed when I have reached my goal weight. Sleep: I averaged about 47 minutes of sleep per night from Monday to Friday this week (I know… I know). Exercise: HA! Yeah, that’s a whole lotta none. Zip. Zilch. I didn’t even take the dog for a walk like I normally do. I just took her to a local dog park and let her run around. Diet: If it wasn’t from a box or a grilled cheese sandwich, I didn’t eat it. I literally consumed zero vegetables. Overall feeling: I feel fairly sluggish. This is probably due in part to the fact that I have eaten almost nothing but pure crap, but also in part to the sleeping pattern. Goals for next week: My goal is to get more sleep, around 5-6 hours per night if I’m being at all realistic. I want to try a green shake/smoothie, and if I like it I’ll post the recipe, and work at least one vegetable into two meals per day. I’m also doing the Mommy Blogger 21 Day Challenge with Elizabeth from My This ‘N’ That Life officially starting in March, so I’m excited about that as well. Have you seen Elizabeth’s before and during (I won’t say after because I don’t think she’s done yet) pictures? She looks amazing! Between Janet and Elizabeth, I have plenty of motivation! For more Fitness Friday, go check out Fatty Friday at Going Crazy, Wanna Go? Tell her Andrea says hi! Do you have any tips, tricks, or helpful hints? Let me know in the comments!